On March 19 under the UT Idealab leadership interactive seminar on innovative learning methods took place at the Ukrainian Ministry of Education and Science in Kyiv. Nearly 200 participants were educators from different universities all over Ukraine. Seminar was organized in collaboration with Ukrainian partner organization “Platform for Innovative Partnership”, in Ukraine known as Yep. Opening words were made by the Deputy Minister Mr Strikha Maksim Vitaliyovitch, who encouraged participants being more active in using new teaching learning methods and highlighted the role of Estonia in supporting development of Ukrainian educational system. The seminar was the last event targeted to educators in the framework of the project "Transforming Estonian Best Practice of Practical Entrepreneurship Studies to Ukrainian Universities” initiated by the UT IdeaLab. Project was ended with the reception at the Embassy of Estonia in Kyiv. Ambassador of Estonia Mr Gert Antsu acknowledged the work done in spreading entrepreneurship knowledge and skills among Ukrainian young people and contributing to the foundation of start-up ecosystem. Young entrepreneurs who had started their start-up development at business ideas development programme Yep!STARTER expressed their gratitude for the knowledge and skills received from the participation in the programme. In their words the programme designed on the UT IdeaLab best practice gave them experience and contacts they would not have got from ordinary academic studies. The best teams had an opportunity to present their business ideas in Tartu at the international business festival sTARTUp Day. 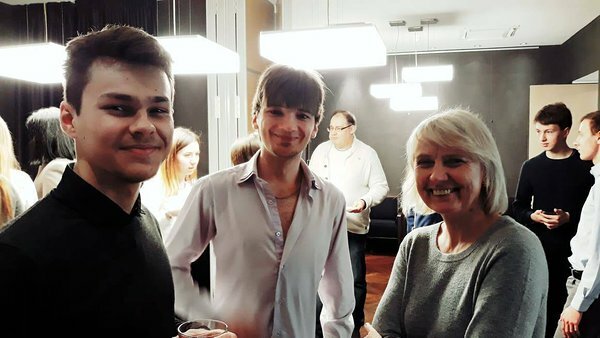 Ihor Levenets, a student from Taras Shevchenko National University of Kiev and founder of GiftHub was excited for the opportunity. He could meet and talk to Martin Villing, the co-founder of Bolt (Toxify), the man who he greatly admires. Yep! STARTER winners Ihor Levenets and Serh Kruchok at the Estonian Embassy in Kiev. In 2017-2019 UT IdeaLab run a project in Ukraine targeted students and educators and aiming to transform the best practice of practical entrepreneurship studies to Ukrainian universities. The project consisted of long business development programme Yep!STARTER targeted to students and two seminars on active learning-teaching methods to educators. As a result of the project 34 teams from different Ukrainian universities graduated the idea development programme Yep!STARTER. According to IdeaLab manager Maret Ahonen the students were highly motivated. Total number of participants was more than 500 and their eagerness to explore and practice new knowledge was impressive. Our seminars often ended with students asking several questions and discussions with each other. The success of the project won’t have been possible without the Ukrainian partner organisation leaders Mr Andriy Zaikin who managed to involve and link different stakeholders from universities and businesses. The project started with four universities: Kyiv National Economic University, Taras Shevchenko National University of Kyiv, the National Aviation University and Donetsk National Technical University. Today Yep network involves nearly 30 universities all over Ukraine. Most of them have founded Start-up Clubs that connects entrepreneurial minded people who initiate relevant activities in their university. 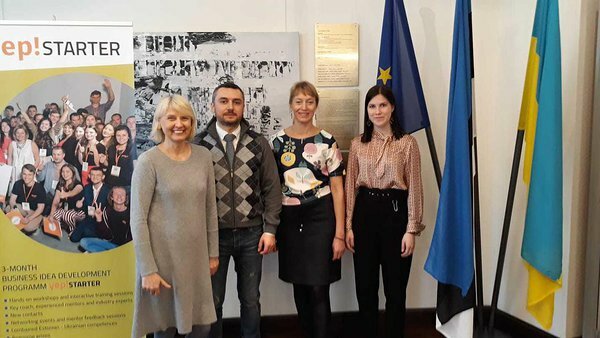 Maret Ahonen and Piret Arusaar with project partners Andriy Zaikin and Valery Holierova at the Estonian Embassy in Kiev. 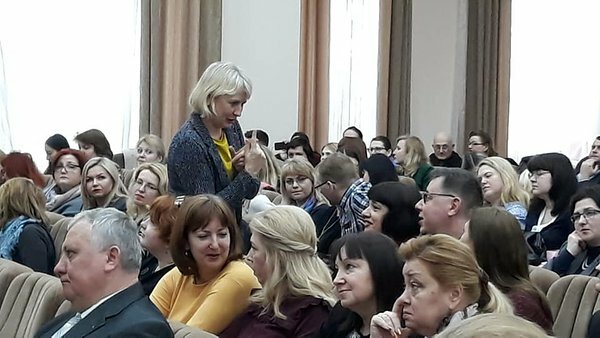 In collaboration with the partner organisation and the Ukranian Ministry of Education and Science two seminars for educators on active teaching-learning methods were organised for nearly 300 participants from different parts of Ukraine. Seminars were supervised by Elina Kallas (School of Economics and Business Administration) who focused on creative techniques and how to apply them in study process. Olga Bogdanova from Johan Skytte Institute of Political Studies introduced innovative methods to activate learning. Both seminars were popular among teachers all over Ukraine. For example, Kristina Babenko from Kharkiv came to the seminar to learn new ways upgrade learning process. She was satisfied with the day saying that: „All activities were useful; I believe I will use more group-work methods in my classes “.